Are you sick of drinking straight from the bottle? Want to display your wine for your guests? If you're a wine enthusiast, you know that to properly enjoy a wine you must let it breathe before taking the first unmistakable sip.It ensures that your wine is aerated to the optimal level, bringing out the intense flavors and aromas. Garwarm decanter is made of 100% lead-free crystal glass.Pouring the wine from the bottle to the decanter also oxygenates the wine and releases its rich aroma and flavor.The unique and beautiful wine decante can class up your home bar,display your wine for your guests. -Thin neck makes it easy to hold. -Easy pour slanted spout avoids spilling and dripping. -Deep and large bottom allows for maximum oxygenation of your wine,enhances the purity, aroma and taste all in one easy step. -Elegant gift box package makes it a great idea for a wine gift set for connoisseurs or those that are new to wine. Bourbon, whiskey, scotch, vodka, rum or wine? Fill up your decanter with your favorite drink, and get set to celebrate life's moments! Material:100% hand-blown lead-free high-grade crystal glass.So you can enjoy every sip without worrying about your health.It's thick and sturdy enough to not to chip or break easily while cleaning. Capacity:1000-1200ml.Easily loads a full bottle of wine.Because it is hand-blown,not a mechanized operation,each product is not exactly the same,there will have some error in shape and capacity. 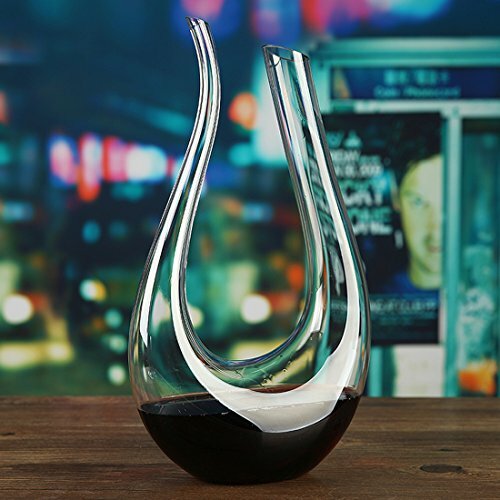 U-shape design looks very unique and delicate.Easy-pour slanted spout can avoid spilling and driping.Wide base of decanter helps soften tannins in your wine. Why you should use the wine decanter?When the wine is poured into the decanter through the larger opening,it can give time to aerate prior to being poured into the pourer from the narrower opening.It will help properly infuse your wine with oxygen,enhance the pure red and release white wine flavors and aromas. Makes the perfect gift.Beautiful gift/storage box makes a great gift for dad,friends,colleagues,clients or associates and wine lovers gifts.It adds an undeniable elegance to your home bar and living room.Using it as a beautiful showpiece or centerpiece on your table is sure to impress your friends and your wine/dine buddies. If you have any questions about this product by Garwarm, contact us by completing and submitting the form below. If you are looking for a specif part number, please include it with your message.